The Tonale at the Geneva Motor Show 2019 marked the proper start of Alfa Romeo’s venture into electrification by using a new plug-in hybrid power train. The SUV is a pretty thing – arguably prettier than its smaller sibling, the Stelvio. The new compact also has a 21-inch ‘phone dial’ wheels pilfered from the 33 Stradale from the ‘60s and a whole new selection of dashboard technology. Read on for what you need to know about the new Tonale. An extremely dynamic and athletic body where the brand’s signature style has been fused perfectly with the energy of a relentless evolutionary thrust. 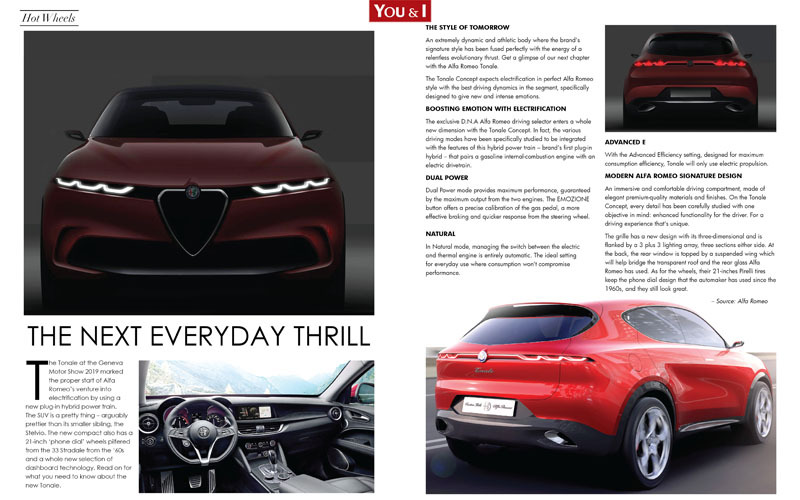 Get a glimpse of our next chapter with the Alfa Romeo Tonale. The Tonale Concept expects electrification in perfect Alfa Romeo style with the best driving dynamics in the segment, specifically designed to give new and intense emotions. The exclusive D.N.A Alfa Romeo driving selector enters a whole new dimension with the Tonale Concept. In fact, the various driving modes have been specifically studied to be integrated with the features of this hybrid power train – brand’s first plug-in hybrid – that pairs a gasoline internal-combustion engine with an electric drivetrain. Dual Power mode provides maximum performance, guaranteed by the maximum output from the two engines. The EMOZIONE button offers a precise calibration of the gas pedal, a more effective braking and quicker response from the steering wheel. In Natural mode, managing the switch between the electric and thermal engine is entirely automatic. The ideal setting for everyday use where consumption won’t compromise performance. With the Advanced Efficiency setting, designed for maximum consumption efficiency, Tonale will only use electric propulsion. An immersive and comfortable driving compartment, made of elegant premium-quality materials and finishes. On the Tonale Concept, every detail has been carefully studied with one objective in mind: enhanced functionality for the driver. For a driving experience that’s unique. The grille has a new design with its three-dimensional and is flanked by a 3 plus 3 lighting array, three sections either side. At the back, the rear window is topped by a suspended wing which will help bridge the transparent roof and the rear glass Alfa Romeo has used. As for the wheels, their 21-inches Pirelli tires keep the phone dial design that the automaker has used since the 1960s, and they still look great.